You know, the new wave of the perfect pintrest picture people: the 30 second ‘make food mixed with beauty’ people. The Martha Stewart meets Julia Child meets tommy the tech guy. You’ve seen the super snippets of food video that have taken the internet by storm. Those 30 seconds that lead to a fully cooked and decorated Thanksgiving meal, complete with homemade turkey name plates to greet each loving guest. Usually I just bypass those with a smile. I truly am glad that some people have the talent to pull all of those off. Usually I am not foolish enough to think that I can even play in the same city, let alone the same park at these folks. But this Halloween simply snuck up on me. In a desperate attempt to find some sort of ‘my mom is so Halloween Cool!’ check mark in the kiddos eyes, I got lured into one of the ‘look how easy this is!’ video snippets. The one that made worms in the straws. 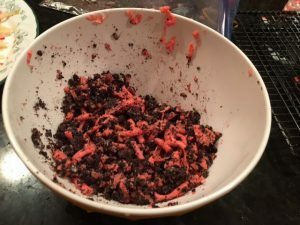 Made form gooey gelatin that somehow magically pours itself into the straws, leaving no mess behind, then slithered out of it’s own accord, to mix gleefully with perfectly crunched oreos to create the perfect ‘ewwww, this is so creepy cool!’ reaction. In trying to reenact this grand affair in real time, the only ‘quick’ thing about this endeavor was the realization that they left a few things on the editing floor. 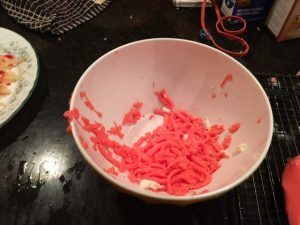 Enter impromptu edit #1: the frosting fix! Yep – that’s exactly what I did – opened the frosting and just dunked all the straws in there. You won’t see THAT on the pinterest board! Next was the actual pouring. I don’t know how they did it so perfectly in the video, but I had gelatin goo EVERYWHERE. Between the straws, pooling in the jar. Even running down my arms! There is a reason why I moved away from the Jell-o state, and this brought it all vividly to my memory. As the concoction sat in the fridge, I actually let my long-subdued wanna be crafty self submerge for a season of hope. This really could be the time it works! I really could be sending my kiddos to school with super cool halloween snacks after all! I went to bed last night with visions of wormy treats dancing in my head. Which quickly turned to dreams about snakes eating my children. No joke. That probably had more to do with us taking our kiddos to the jungle over Christmas (a post for an entirely different day! ), but I should have taken it as an omen nonetheless. I got up this morning, pulled the straws out, and laughably thought this would be just like the video – the saintly fingers gently coaxing the perfectly formed worms from their hibernation. 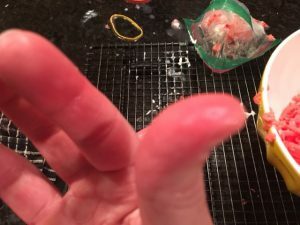 See these blood-red fingers?? That is NOT jello stain people. 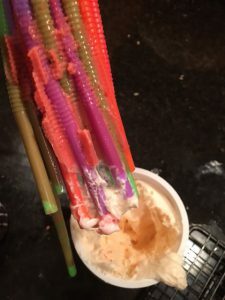 Those ridges on the flex straws HURT! Even as I type this, my fingers are still missing a few layers of skin on them. 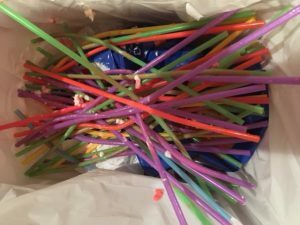 Speaking of the straws – what they forgot to mention in the video was that this project is NOT conducive to the cheap-o walmart ‘extended flex!’ crap. They meant for you to use INDUSTRIAL strength, non-stick polymer-filled straws (probably available by special order from martha stewart.com…). these ones had worm gust squirting out from all sides. I got so desperate, I even tried my hubby’s (trying not to giggle while he offered) advice to ‘run them under hot water then just blow them out. Yep tried that. Nope. Doesn’t work. Great, now I have raw fingers, AND a ginormous trying-to-blow-up-way-too-small-of-balloon headache! I squeeze, I tug, I rub my fingers raw. Because, at the end of the day, oreos really DO make things better! And THAT, my dear friends, is how NOT to follow a ‘oh, this is super easy, even a non-crafter can do it!’ video. If you need me, I’ll be munching on some worms. that I purchased from the store. hahahahah! i have a HUGE pack of straws that were purchased JUST for this… seems like a stroke of luck that I could not find the time. I feel like maybe spraying the inside of the straws with cooking spray might help? i dunno. Although I have my family blog where I write all of our little day to day happenings… this blog idea has been rolling around in the catacombs of my brain for quite some time. More than just a 'here’s what’s happening in my life' type of a blog, I envision this blog as being a place where I can finally dump all of my 'deep thoughts', as crazy as they may be, and let them come to fruition in the writing about them.